It is easy for your customers as well as your shop if customers give their purchasing decision through the brand they love. 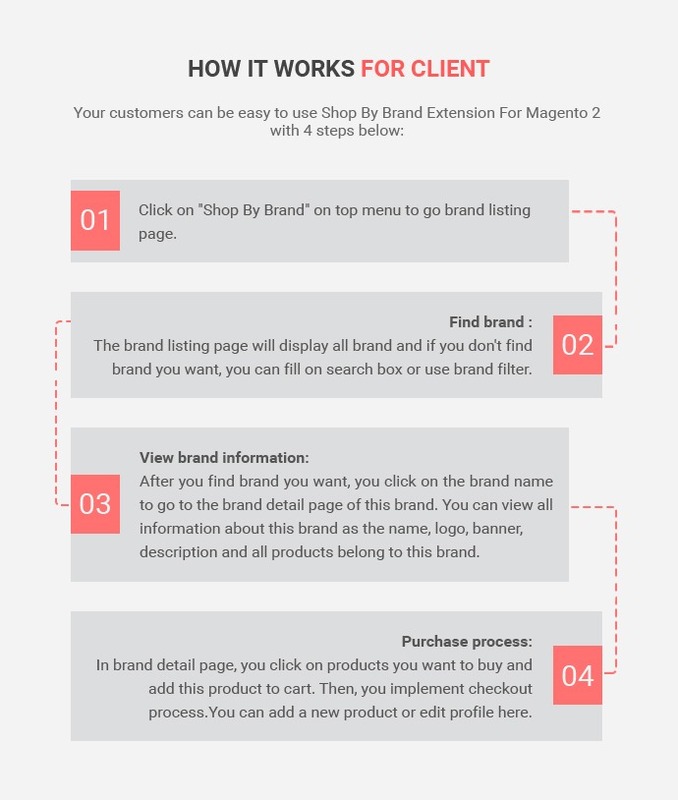 With Shop By Brand Extension for Magento 2, admin can create a custom brand page that displays a list of brands and by clicking on any brands, your customer will view brand information and all products belong to this brand. Easy to filter or search the brand and add brand information as name, logo, banner, description, or select product for this brand. Boost sale: This extension is really helpful in earning customer loyalty of buyers who make purchasing decisions on brand value. Get all brands of all products. Get the brand details: name, logo, banner, description, featured products, or bestseller products. Allow customer to shop by brand in your store. Can search brand through the search box or brand filter. Step 1: Click on "Shop By Brand" on top menu to go brand listing page. Step 2. 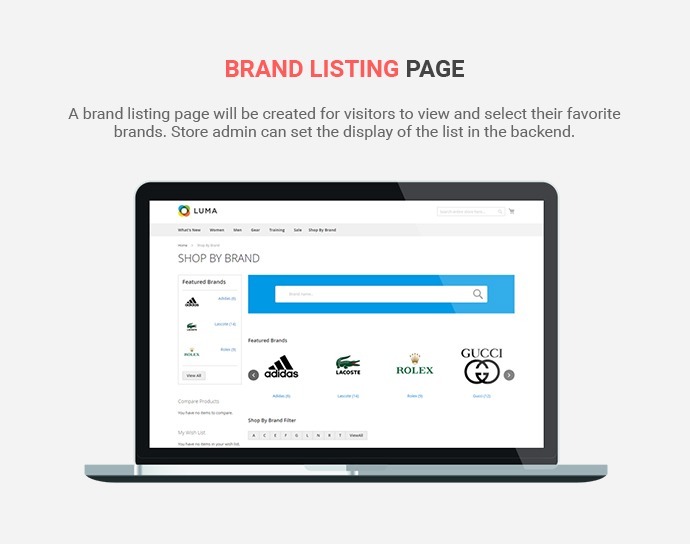 Find brand: The brand listing page will display all brand and if you don't find brand you want, you can fill on search box or use brand filter. Step 3. View brand information: After you find brand you want, you click on the brand name to go to the brand detail page of this brand. You can view all information about this brand as the name, logo, banner, description and all products belong to this brand. Step 4. Purchase process: In brand detail page, you click on products you want to buy and add this product to cart. Then, you implement checkout process. Step 2. Brand Management: In admin panel, you click on SHOP BY BRAND -> Manage Brands -> click on Add New Brand or select a brand to edit. You can add/edit/delete all brands here. Remembering Save after each change. Step 3. 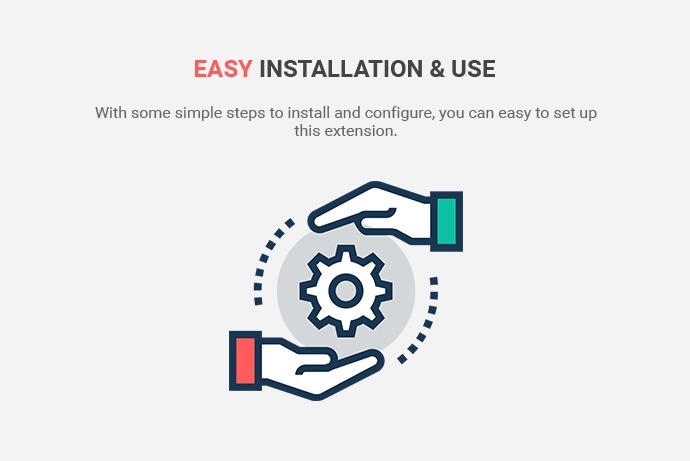 Extension Configuration: In admin panel, you click on SHOP BY BRAND -> Settings and setting something about this extension here. Remembering Save Config after each change. 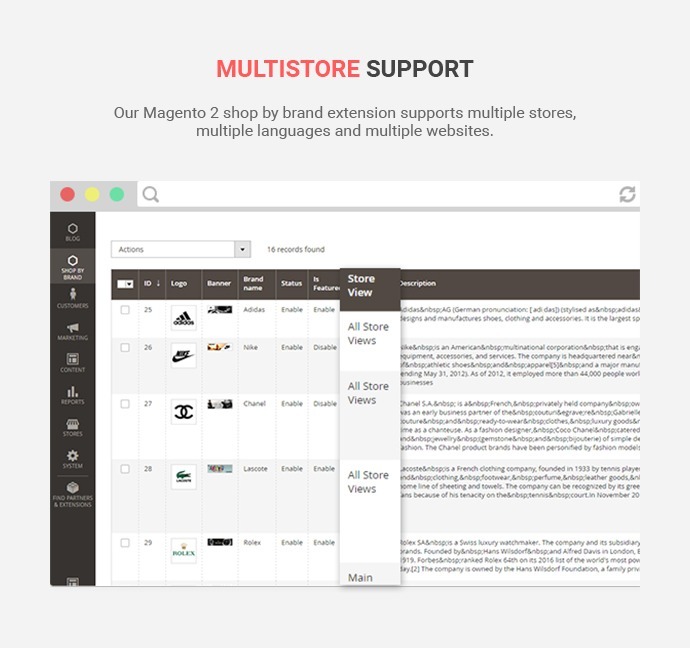 Multistore Support: Our Magento 2 shop by brand extension supports multiple stores, multiple languages and multiple websites. Increasing our sales day. This gives our customer gives there best decision to choice and purchase more to our products of what brand they want to choose. Thanks for CMSmart team, specially Victor for helping us to finish the site. Great solution for webshops. Easy implementation. Great service & support! Thanks! I just want to share my happiness feeling to let you know that your product is the best. It is so great when showing my store on the map. With your support team, I never have any problem at all. Thank you so much! Is this Shop By Brand extension for Magento 2 responsive? How many products can I add in the sidebar? You can add unlimited the products in the sidebar. How many ways to search a brand? You can search this brand in 2 ways, this is search and filter. How many products which the shop owner can add in each brand? You can add unlimited products to each brand. How can I display the brand in the side bar? Can I change the “Page title” with Shop By Brand extension for Magento 2? Yes, you can change it. Please follow instructions here: Shop by brand/ Setting/ List Page Settings/ Page Title. Can I enable or disable brand name and show product count? Yes, you can enable for disable it. Please follow the path here: Shop by brand/ Setting/ Product Detail Page Settings. 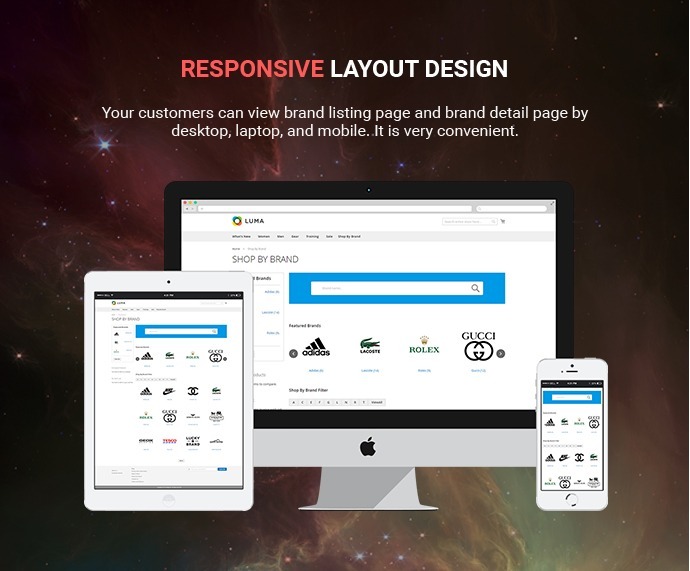 Brand Listing page: it is created to bring customers the convenience when they try to find and select their favorite brands. Admin can set this list on the back-end. 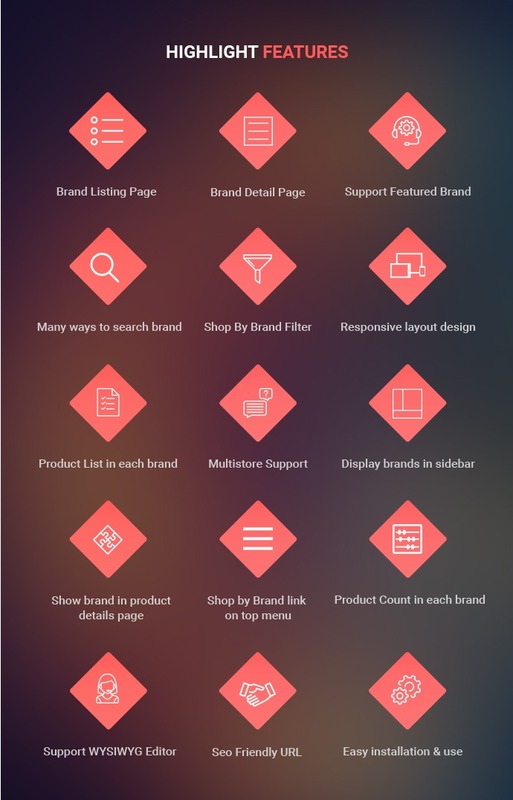 Brand Detail Page: with all necessary information such as brand logo, banner, description and product list, customers can find them fully on the brand detail page and they are configured by admin in the back-end. 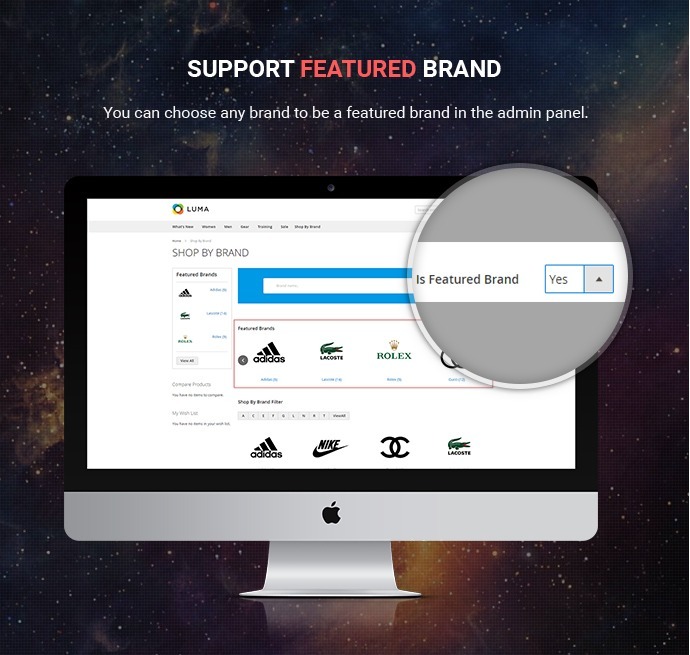 Supporting Featured Brand: in the admin panel, you can choose which brands will be displayed as a featured brand. 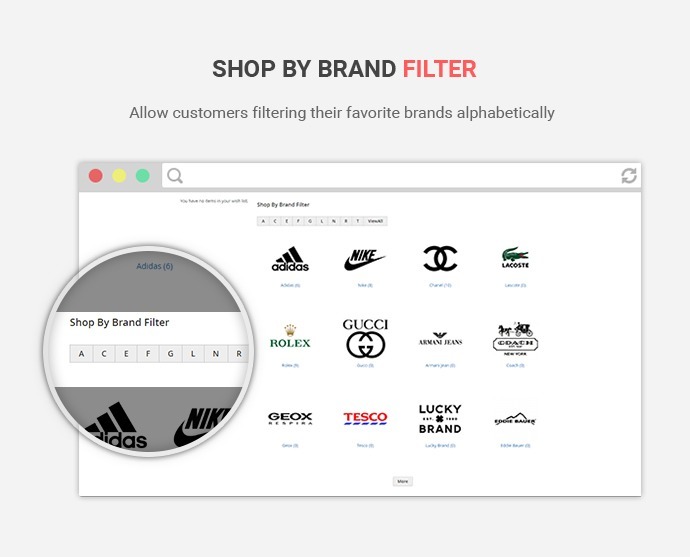 Shop By Brand Filter: Your customers are able to filter their favorite brands alphabetically. 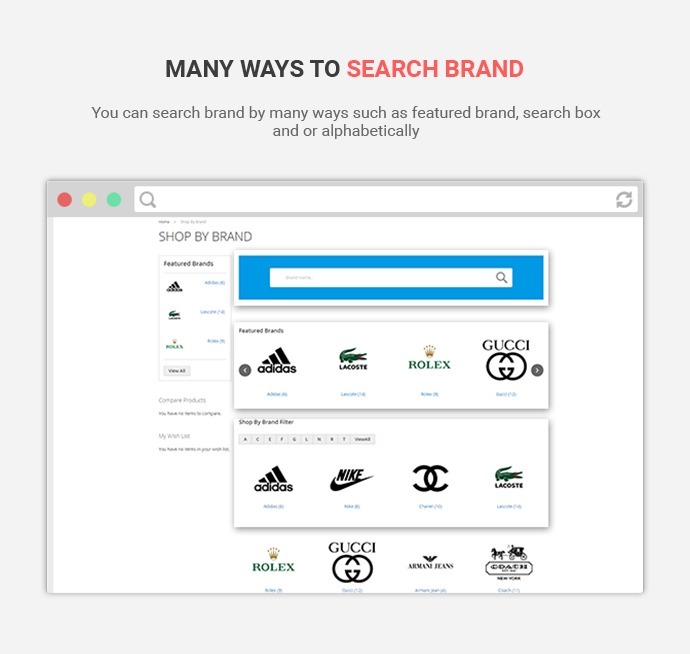 Multiple ways to search brand: Our Magento 2 Shop by Brand extension allows you to search by the brand through different ways such as featured brand, search box and or alphabetically. Supporting multi stores: Our extension is designed to support multiple stores, multiple languages and multiple websites. 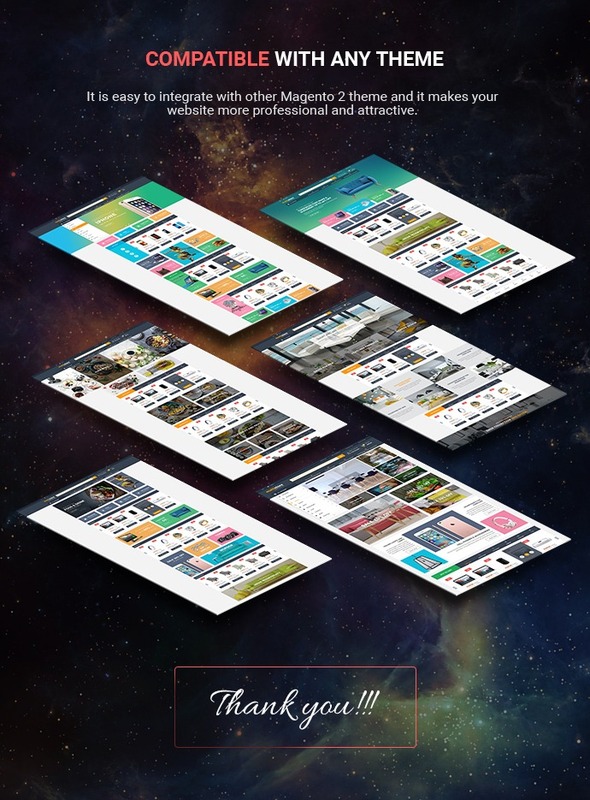 Ultimate Responsive layout design: This feature comes from the desire to help attract customers who use different smart devices such as the smartphone, tablet, desktop, etc. Product List in each brand: Magento 2 store locator extension allows store owners to add unlimited products under each brand. Displaying brands in the sidebar: It allows the user to set featured brand and brand information which can be shown or not shown in the sidebar. 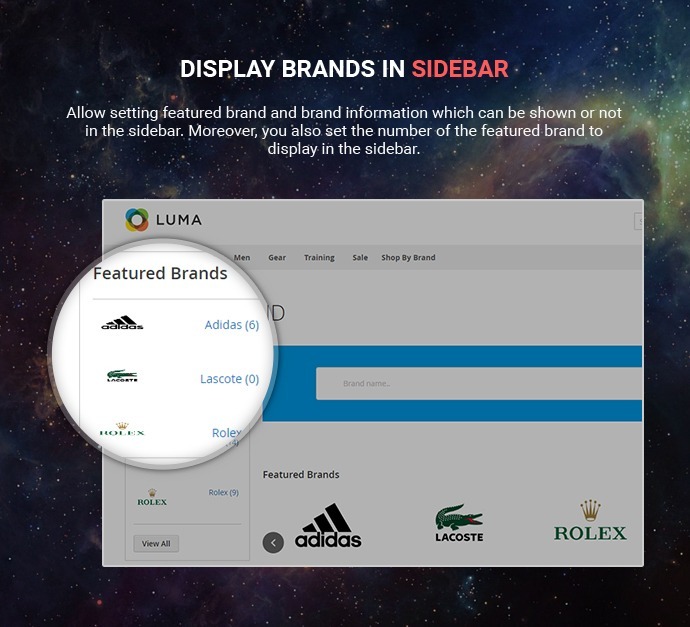 Moreover, you also set the number of the featured brand to display in the sidebar. 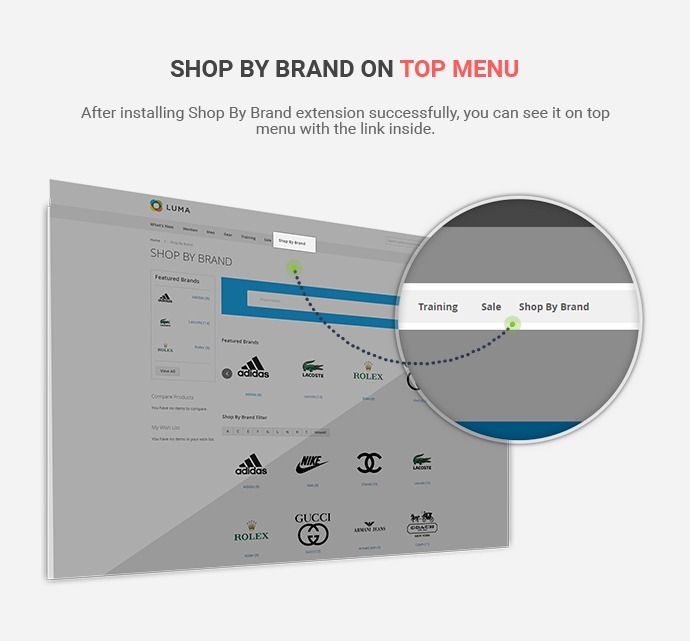 Shop by Brand on top menu: After you install Shop by brand successfully, it will be displayed on top menu with the link inside. Seo Friendly URL: We support SEO with all necessary factors such as meta keywords, meta description and custom URL for a brand. 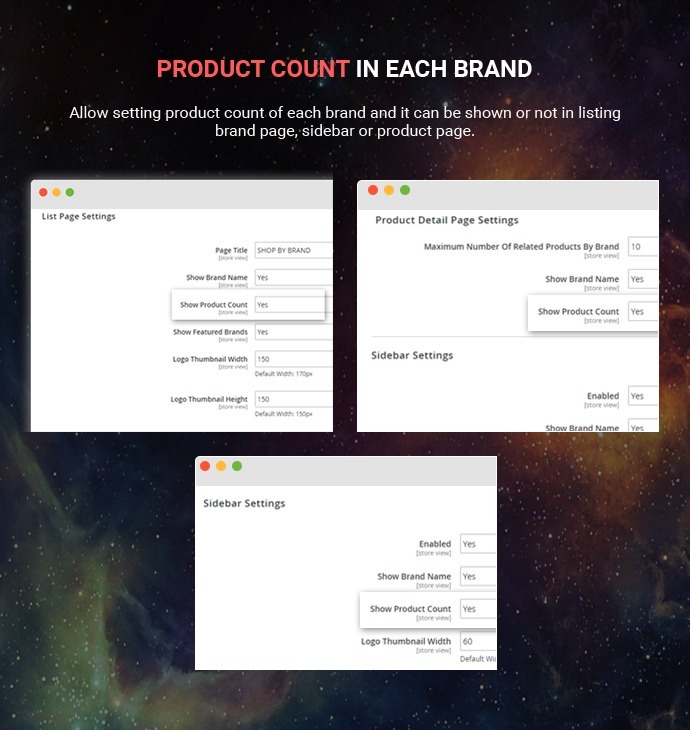 Product Count in each brand: you can set product count of each brand and decide whether show or not show them in listing brand page, sidebar or product page. 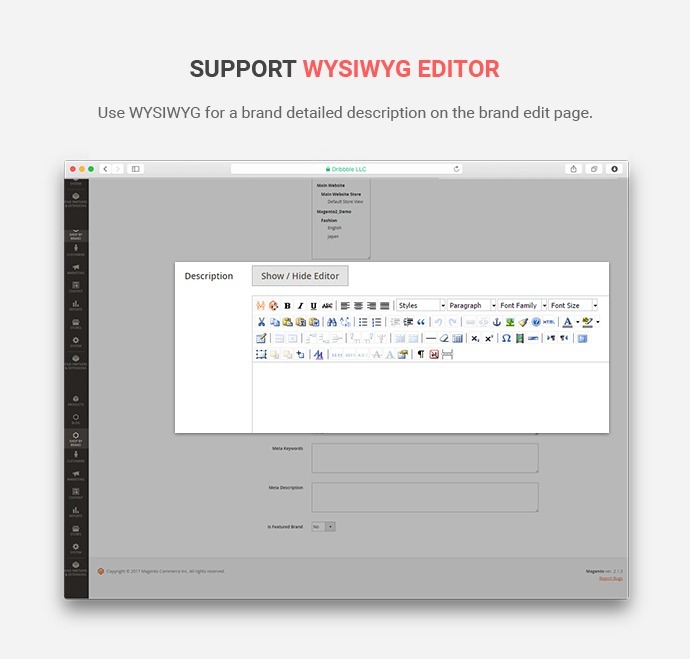 Support WYSIWYG Editor: We integrate WYSIWYG for a brand detailed description on the brand edit page. Compatible with any theme: We create this Magento 2 Shop by brand for all Magento 2 themes, we desire that it will make your business website become more professional, more convenient and able to attract more customers. Magento 2 shop by brand extension – Which should be chosen? Shop by brand is a necessity for every e-commerce e-business. 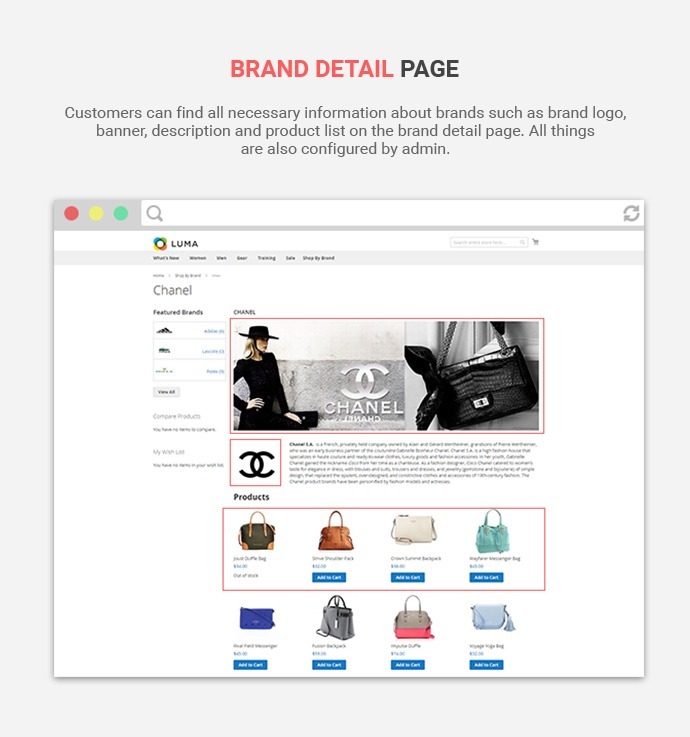 This feature allows customers to do shopping through finding their favorite brands on your website. Especially, if your business’ field belongs to Fashion, Officer Tools and others the feature needs to be added into your web-store. The feature is as same as easy navigation you bring to your customers, helping them look for desirable products as fast as possible. However, to arrange or show brand list on the page in a normal way will do not make your site attractive. With regard to Magento 2 solution, the platform was born as the result of the best open-source platform. This version has resolved disadvantages of the last one and at the same time supplies a huge range of many advanced features. Among them, we must tell the higher performance of your website. 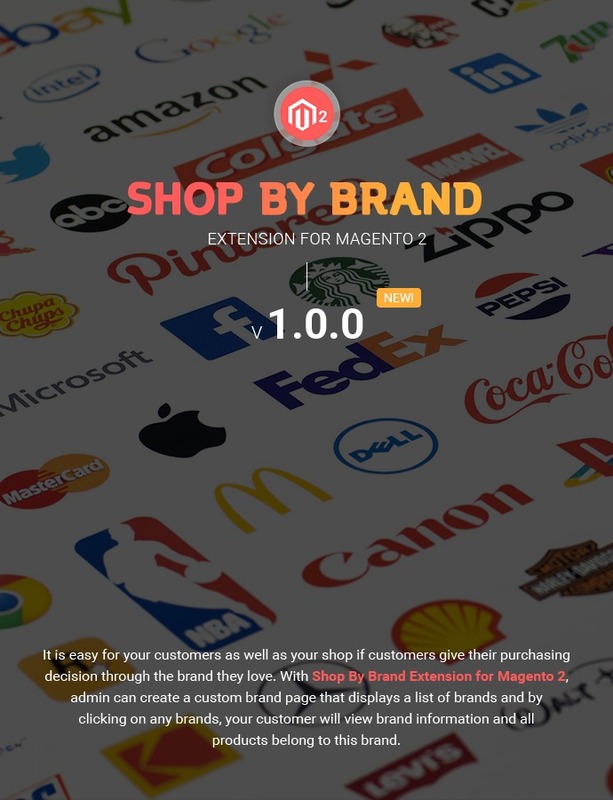 Magento 2 Shop By Brand is released as the result of the last version of Magento 1, with many new innovations and complete features. For each solution provider, the price is different and the features are not as same as together. However, when installing a module to our web-store, we always need to consider which product is valuable and saves us much cost, gives us more effects. 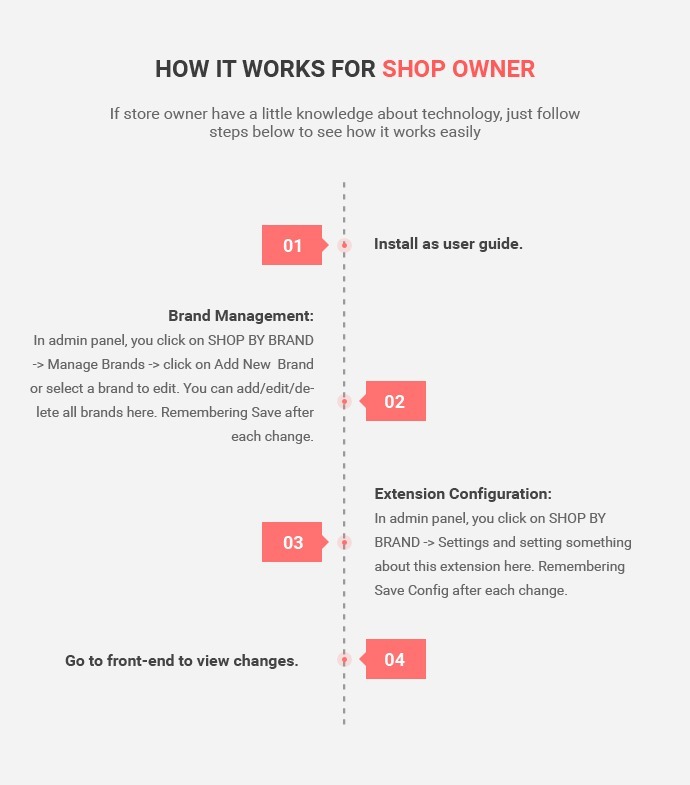 This table helps us give an ideal Magento 2 Shop By Brand extension that is developed by CMSmart market. For Web-store owner: You can find easier to filter or search brands and add brand’s information as name, logo, banner, description, or select product for which brand you want. It is helpful for you to get customer’s loyalty, boosting their love and encouraging them to do shopping on your site. For Customers: Get all brands with related products, featured brands, brand details: name, logo, banner, description, featured products or best-seller products. Besides, it supports search brand feature with many brands in the search box and brand filter, bringing the most comfort to shoppers. On the Homepage of your site, Shop By Brand will be added to the Top Menu for customers to easily click on and look for their brand’s product. 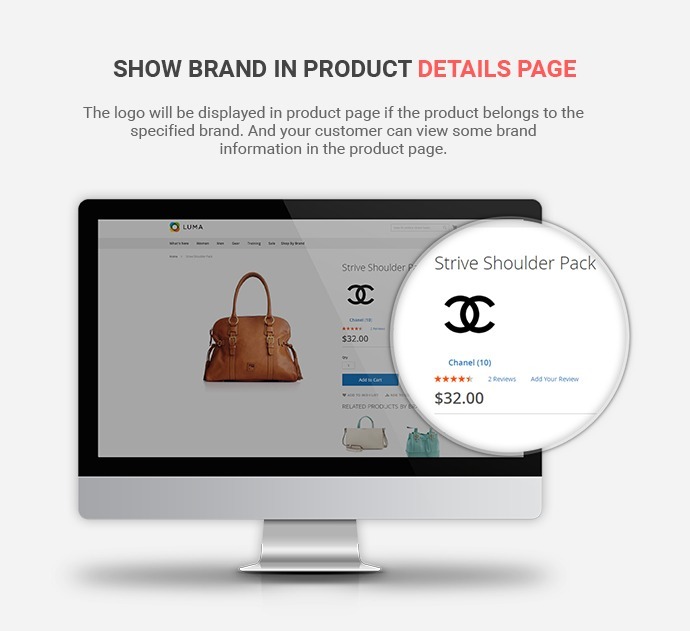 After clicking on Shop By Brand tab, a Brand Listing page will be shown out. This is created for visitors to view and select brands as they wish. In order to select products of a Brand, the customer just needs to click on the Brand and a Brand detail page will display necessary information of brands like logo, banner, description, and product list for them to make conference. Right on the Brand listing page, customers can see Featured Brands right on the tab Navigation menu that allows shoppers to choose any brand as be featured on. The shop By brand brings many ways to search brands, like featured brand, search box and alphabetically (Shop By Brand filter Feature). One more important thing of the module is responsive. This is very effective for online business in enjoying a huge number of customers through numerous devices, mobile phones, computers and tables. Easy installation and configuration while you still ultimate its functions. 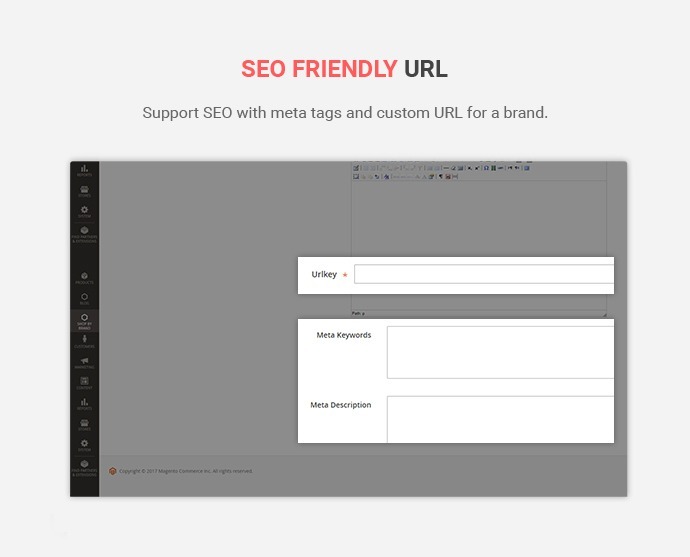 More importantly, SEO friendly URL with Meta words, description and Custom URL for a brand, ensuring to enhance your SEO. WYSIWYG editor is also supported, allowing you to add full information of the brand on each brand edit page in the back-end. An outstanding feature of Magento 2 Shop By Brand of NetBase is Product count in each brand. 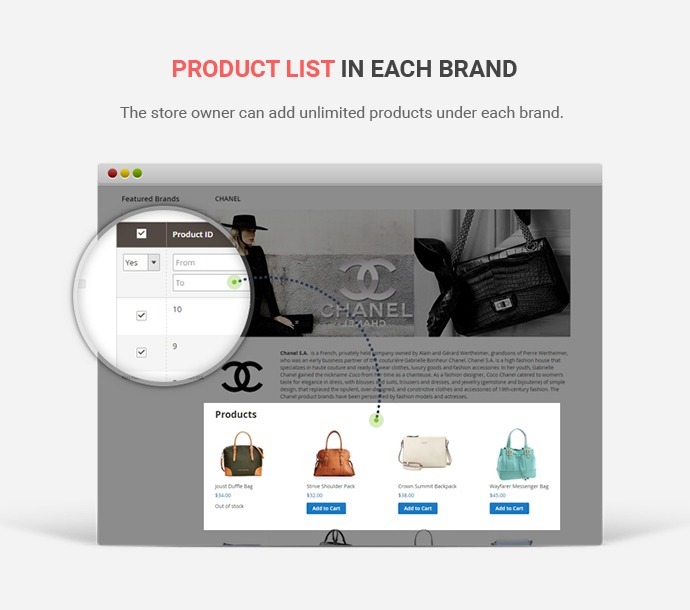 This function allows the web-store owner to set product count of each brand and it can be shown or not in listing brand page, sidebar or product page. Now, it’s time for you to discover Magento 2 Shop By Brand for your site.